LinkedIn is the most popular social media tool among the nation's fastest-growing private companies, according to a study by the University of Massachusetts at Dartmouth, Center for Marketing Research, under the direction of researcher Nora Ganim Barnes, PhD. More than 8 in 10 companies listed on the 2012 Inc. 500 (81% of them) use the professional networking site, up from 73% a year earlier. Meanwhile, the proportion of Inc. 500 companies using Facebook has declined, from 74% in 2011, to 67% in 2012. Blogging gained momentum in 2012: 44% of Inc. 500 companies now publish a blog, up from 37% a year earlier. Software, advertising/marketing, and media companies were the most likely to blog in 2012, whereas government services organizations were least likely to do so. Foursquare use has doubled, from 13% of companies in 2011, to 28% in 2012. The proportion of companies using YouTube has fallen, from 45% in 2011, to 30% in 2012. 18% of 2012 Inc. 500 companies use Pinterest. 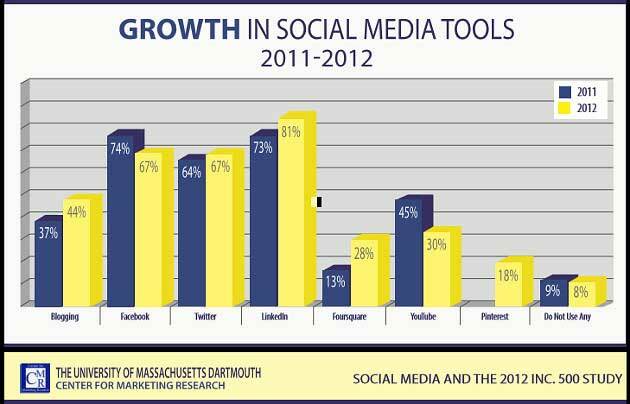 Below, additional findings from the 2012 Inc. 500 study of social media use, conducted by the University of Massachusetts Dartmouth, Center for Marketing Research. Lenna Garibian is a MarketingProfs research writer and a marketing consultant in the tech industry, where she develops engaging content that builds thought leadership and revenue opportunities for clients. She's held marketing and research positions at eRPortal Software, GAP Inc., Stanford University, and the IMF. Reach Lenna via Twitter @LennaAnahid and LinkedIn.